Across the world, well-established principles and standards fundamental to maintaining a safe and enabling environment for civil society are being questioned and threatened in mature and consolidated democracies. In both the global North and global South, governments with vibrant civil societies and constitutional and historical commitments based on their struggles for democracy and freedom are adopting increasingly hostile and corrosive policies and practices to suppress independent civil society voices. 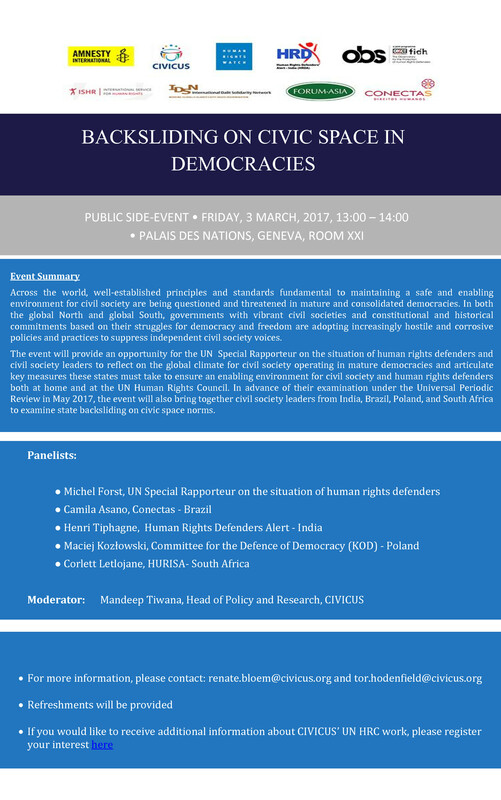 The event will provide an opportunity for the UN Special Rapporteur on the situation of human rights defenders and civil society leaders to reflect on the global climate for civil society operating in mature democracies and articulate key measures these states must take to ensure an enabling environment for civil society and human rights defenders both at home and at the UN Human Rights Council. In advance of their examination under the Universal Periodic Review in May 2017, the event will also bring together civil society leaders from India, Brazil, Poland, and South Africa to examine state backsliding on civic space norms.